Enjoy all of the seasons pumpkin flavors right in one delicious spiked cafe latte. Loaded with flavor and spice, it will be sure warm your soul during an evening by the fire. You don't need to hit up your local coffee shop for a seasonal pumpkin coffee this autumn. You can make one in the comfort of your own home — and with the added kick of booze, it's even better. What better way to relax as the weather gets cooler than with a boozy coffee? So dive right in and warm your soul! In a large mug, heat the milk in the microwave. Using a handheld milk frother, froth the milk until it is foamy. 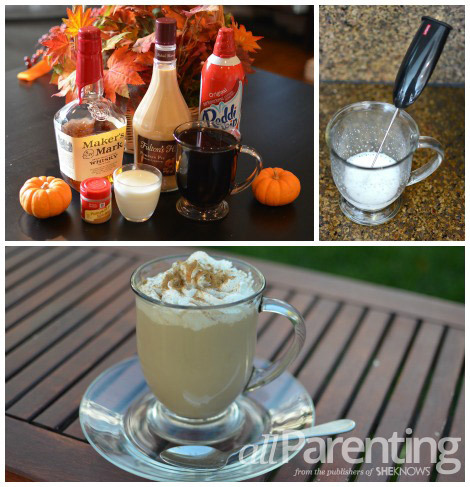 Add the coffee, pumpkin pie liqueur, and bourbon to mug. Stir to combine. Add the whipped cream on top and sprinkle with the pumpkin spice seasoning.